Step 1: Locate the correct screen. The beginning of the year screen is located on page 10 and the end of term reviews are located on pages 23 and 24 in the 2018 Phonic & sight word sequence or is available to download here. Step 2: It is essential that the screening commences from stage 1. Although it might seem attractive to shortcut the placement process, by limiting the number of stages presented, this is NOT recommended. Refer to the examples provided on pages 13-15 in the 2018 Phonic & sight word sequence. Please note that the testing templates on pages 11 and 12 all commence from stage 1. 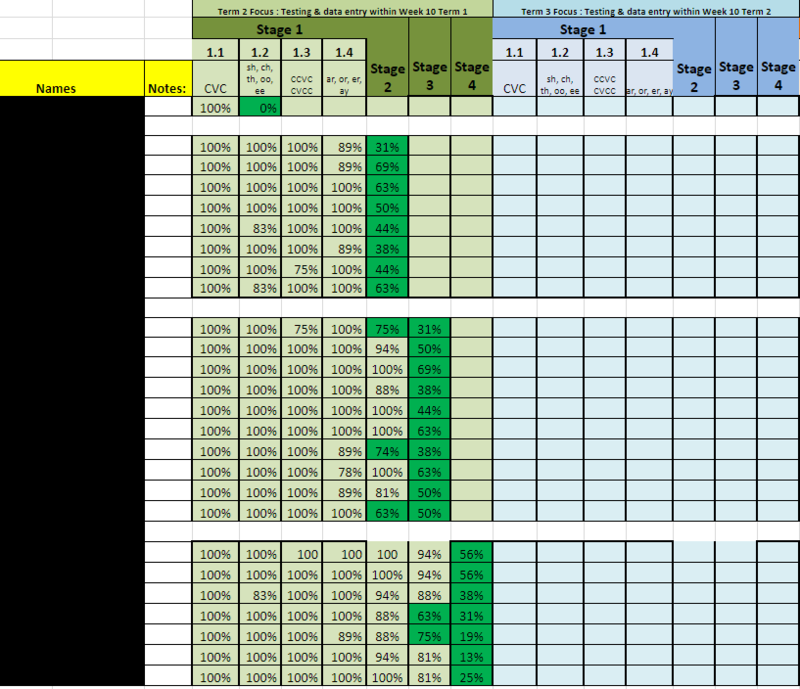 Step 4: Enter the percentages into excel. Remember when marking to judge what level you are going to base your next term&apos;s teaching on. Typically this is where students drop below 85% in their scores (but keep in mind a degree of teacher judgement may be required for some students). 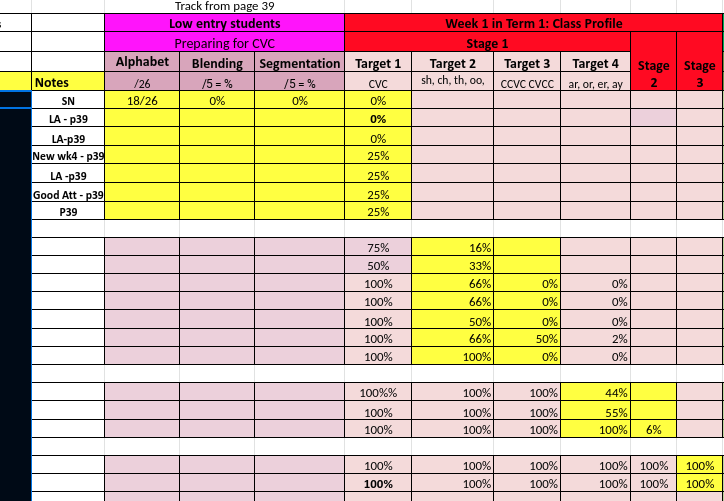 For each student, highlight the cell that indicates what you intend to teach over the next cycle/term. Step 5: Chnang the order of the students from alphabetical order, to ability groups. This will facilitate from pure data entry, to representing your class in groupings that cluster similar needs together. To do this, highlight rows, right click and cut and paste to group like students together. The following examples have students clustered in 3 ability groups. Remote Schools: It is possible to include and set goals for the lower operating students. Refer to the Pre-Literacy/Pre-CVC students with results for alphabet sounds, phonemic blending (pre-reading) and segmentation (pre-spelling) included on the sheets. Rather than utilizing Excel, it is recommended that the Excel sheet is converted into a cloud based sheet E.g. A &apos;Google&apos; sheet will enable multiple staff to simultaneously add student testing. If using Excel, only one user at a time will be able to add information to the sheet. When processing the placement tests, make sure that decisions are made about students on the basis of their results and not too much teacher judgement. Typically, the first stage at which students score under 85% (hence allowing a few errors to be made) is the level that teaching efforts need to be made to strengthen skills. 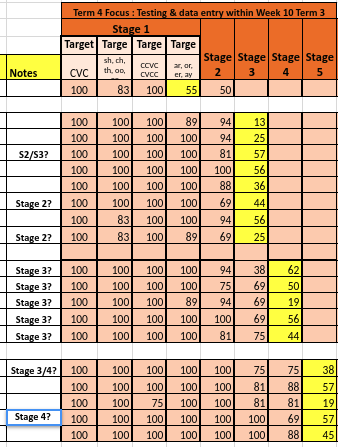 See below (within the notes column) the accuracy of how this particular teacher has grouped the students is being questioned For example the 7th student is listed as requiring stage 3 concepts but they have tested at 69% in stage 2. It is likely that some stage 2 teaching is required, or a combination of stage 2 and 3 concepts are presented. It is unlikely that by just presenting stage 3 concepts that this student will progress at a satisfactory rate over the term. By identifying and targeting the initial point at which accuracy drops, this typically has a significant impact on student outcomes over a term of instruction. While the testing needs to commence from stage 1, so does the entry of results. The following short-cut process of entering only some of the student’s testing results is also not recommended. The entry of the full spelling profile is what is recommended. It is recommended that classes are profiled, rather than placing all of the students in each year level in the same sheet. 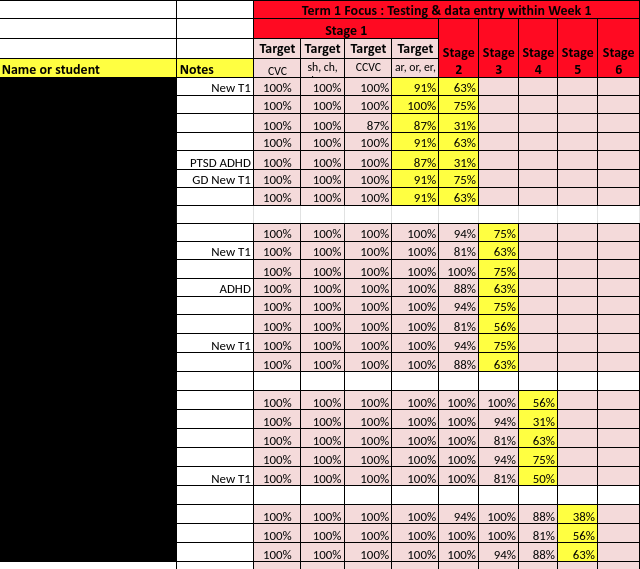 For example it is recommended that Year 1 gold, Year 1 blue and Year 1-2 red are on three different tracking sheets rather than placing all of the Year 1 students on the same sheet. Why is the following example not recommended? 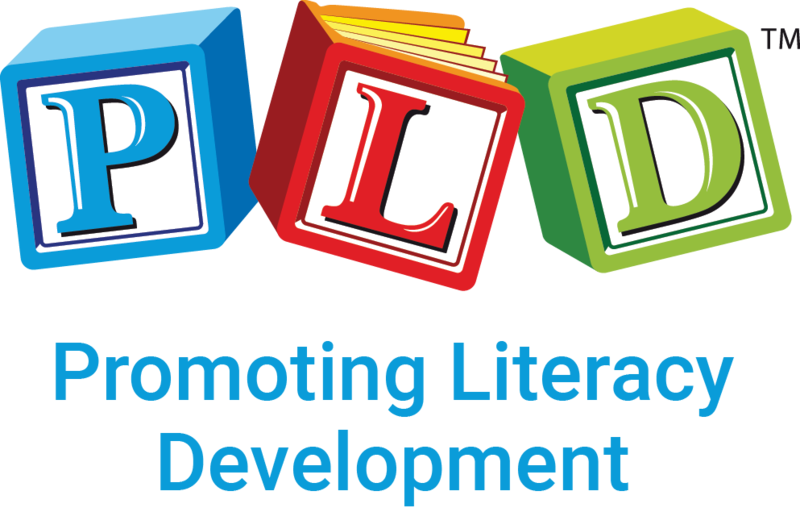 The class profile and the grouping of students within that particular class (as outlined above) will demonstrate on a practical level how the PLD programs are being implemented and how the range in ability within that particular class is being organised. 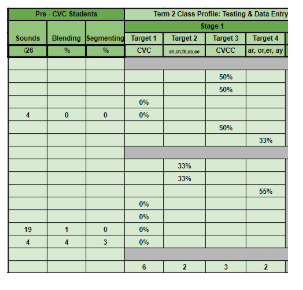 In schools with multiple classes with the same year level, the higher performing teachers and classrooms will be identified within this process. This will enable classroom visits and viewings to be scheduled within the school. This typically builds an internal capacity of a school to train their staff and improve the culture of teaching SSP (structured synthetic phonics) within the school. For information on the class profiles and tracking in the &apos;Early Years&apos; and &apos;Foundation&apos; school year click HERE. If you require additional support, we recommend taking a look at the short online courses . Each of the courses recommend screening to track student development and to assist programming. The courses can be viewed HERE.